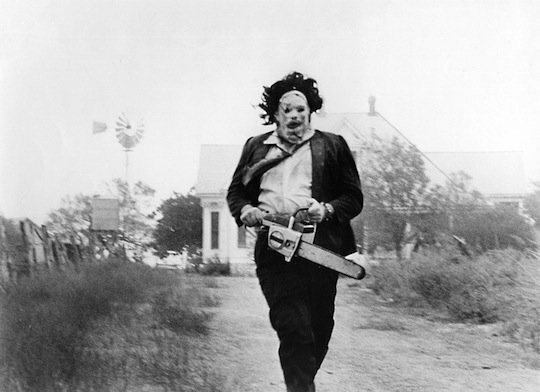 Gunnar Hansen (1947-2015), famed for his portrayal of the chainsaw-wielding Leatherface in the classic horror film, The Texas Chainsaw Massacre (1974), died last week of cancer. His agent called the character, “one of the most iconic evil figures in the history of cinema.” Yet Hansen in real life –all 6 - 4 and 300 pounds of him – was a writer and poet at heart—and a bookman. 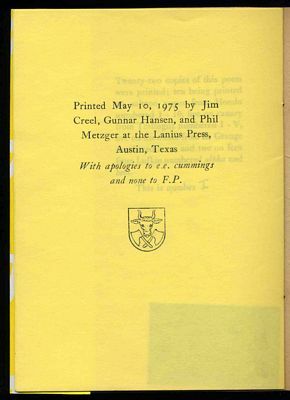 While in graduate school at the University of Texas, Hansen took a bibliography course from William B. Todd (1919-2011), one of the most noted American bibliographers whose wide-ranging interests spanned Richard Nixon's Watergate transcripts to literary forgeries. 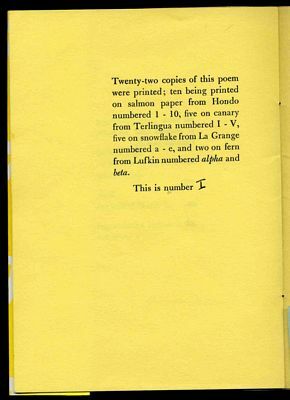 Hansen and a couple of fellow students, inspired by Todd’s enthusiasm, decided to play a little biblio-trick on him. 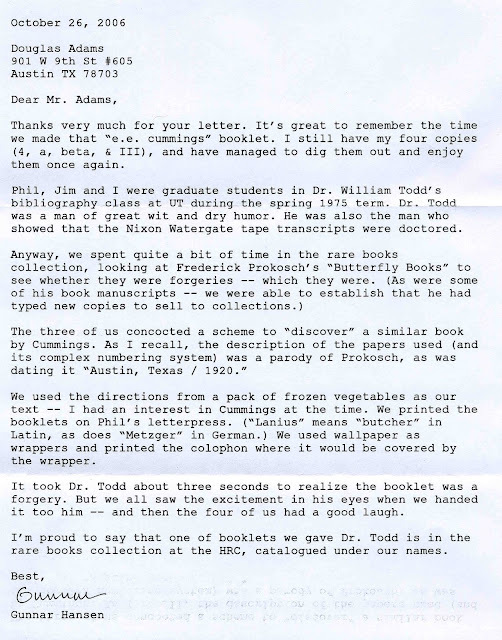 Douglas Adams, collector of literary forgery material, was the first to identify the item that linked Leatherface to Bill Todd and the rich bookdom of the Humanities Research Center at the University of Texas. I’ll let Douglas (and Gunnar) tell the story from here. Cummings, E[dward] E[stlin]. vege(song)table. Austin: n.p., 1920. This small book is a clever parody of Prokosch’s butterfly books and was produced by University of Texas students taking William B. Todd’s bibliography class, hoping to fool their instructor. 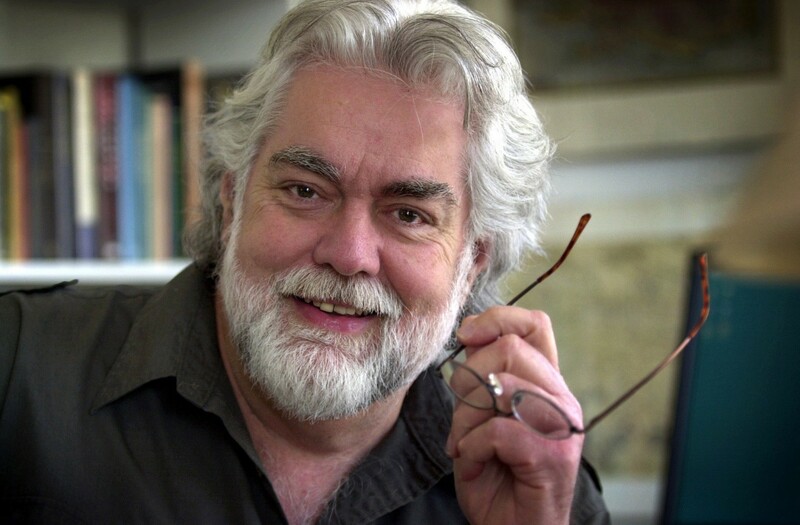 Included below is a letter from Gunnar Hansen detailing the process of creating the hoax. 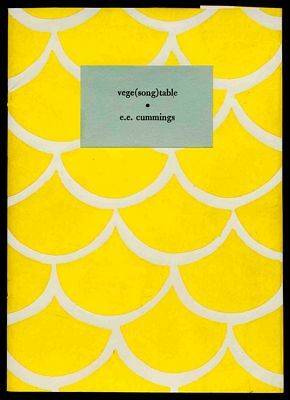 Incidentally, the text for the fake Cummings poem was taken from a package of vegetables. Pity he didn't use a Hinman collator as the murder weapon, but I suppose that would have been somewhat unwieldy. Good thing Thomas J. Wise wasn't around to feel his wrath.